The actual design consists of a much bulkier fuselage to support larger engines and more fuel, a shorter nose with more protection for the canopy, and greater malleability/flexibility for the wings and fins so they can retract or deploy based on the environment. The actual craft is still somewhat sleek but doesn't need to be as aerodynamic because its much greater source of power (fusion) allows it to operate more on brute force. A Starthroat could hover above the surface of the Earth using its ventral thrusters for days. And the thrust generated by the rear rocket nozzles would be so big and bright that you wouldn't be able to see much of the fighter. Shape/Fuselage: Most of us have heard the term "aerodynamic" at one point or another. In Layman's terms, the more aerodynamic an object is, the better it moves through the atmosphere. Air causes friction and drag on an aircraft, slowing it down. Thus, the less surface area that's exposed to the air in the direction of motion, the more efficiently the plane moves. This is why aircraft often have sleek shapes with tapered noses and so forth. In the vacuum of space, however, there's no air or drag, so the shape of the spacecraft doesn't matter. A cube moves just as well as the sleekest, coolest looking plane. As a matter of fact, a cube or sphere is a more practical shape for a spacecraft than any modern aircraft design. This is because an aircraft essentially has one direction it flies (forward) and the laws of aerodynamics make abrupt changes in any other direction impractical. In space, without any air, a box or ball could alter its trajectory in any direction at any given moment. Thus, a spherical or cubical spacecraft doesn't need a "front" or "back" or "top" or "bottom" or any "side." A cube or sphere ship would have rockets and viewports on every surface and the pilot inside could pivot to face the direction in which he or she directed the ship. But wait a minute. If cubes or spheres are more practical shapes for spacecraft, why aren't the star fighters in BC9 shaped as such? The answer begins with the fact that BC9 isn't set a few decades or a mere century in the future. It's set over two hundred years in the future, and designs have come full circle from modern day. A Starthroat isn't just a spacecraft. It's an aerospace craft, a hybrid vehicle capable of high performance in both atmosphere and space. A craft limited to space flight should absolutely be shaped to operate in the vacuum of space, but what about a vehicle that must operate in both atmosphere and vacuum? If we take the laws of physics into account (unlike Hollywood), what does a space cube do if the enemy it's pursuing descends toward a planet? Atmospheric drag would be a huge problem for the cube. A sphere would encounter less drag, but still more than a modern cone-shaped rocket or bird-like aircraft. A sphere or a cube would also need to continuously fire rockets to stay aloft in the air. Conversely, a sleek craft with an aerodynamic shape has no difficulties performing in vacuum but is far better equipped to operate in atmosphere. At first thought, the drawback of shaping a future spacecraft like a modern airplane is that the craft can't move in any direction along the x, y, or z axes as easily. However, if we keep in mind that shape doesn't matter in space, we can place thrusters all over our aerodynamic spacecraft and accomplish the same freedom of motion regardless of shape. In a spacecraft shaped like a modern aircraft, a pilot is stuck facing forward rather than being able to pivot their body in any direction like in a cube or sphere. But I think about it this way. Human beings have two eyes in the front of their heads and need to direct their gaze to interact with the desired target. So instead of physically reorienting the pilot to face any generic side of a cubical or spherical spacecraft, we give the pilot instrumentation that provides an omnidirectional view regardless of the direction the pilot and aerospace craft are pointed. Via a direct neurotronic link between a Starthroat's instruments, its support AI matrix, and the pilot's brain, the pilot is fed a plethora of information. A mental augmented reality (known as heads up display or HUD on modern aircraft) shows the pilot any or all camera views on a whim. In other words, a Starthroat pilot can see in any direction they desire by thinking about it without the need to physically face another direction. The final aspect of Starthroat's fuselage is that the wings, tailfins, and other parts change shape based on the environment. When a Starthroat is hovering or maneuvering in an atmosphere, it would deploy its wings and fins to take advantage of air pressure and conserve fuel, operating more like a conventional aircraft. Conversely, when a Starthroat speeds up in atmosphere or when its operating in space, it would retract the wings and fins. During acceleration in air, the wings and fins would just cause excess drag. 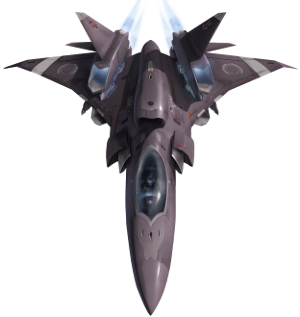 In space, the wings and wings are not only unnecessary, but they're extra targets for enemies. The wings, fins, and much of the fuselage are malleable and flexible like a kind of smart clay made possible by nanotechnology. Think of a more advanced version of how the F-14 Tomcat extends and retracts its wings. So, vehicles dedicated to spaceflight should probably be shaped like cubes or spheres. But in the twenty-third century, when dog fighting aerospace craft could begin their conflict in Saturn orbit, descend into the atmosphere, launch back out into space, and then dive down into Titan's thick air, a vehicle that can operate in all environments is the optimal choice. Power: A fusion reactor provides the necessary power to accelerate our star fighter craft to velocities much higher than anything achievable today. And that same reactor yields enough energy so the pilot of a Starthroat doesn't have to worry about conserving power and fuel and minimizing mass as much as modern spacecraft. Fusion reactors allow for the brute force approach. Nuclear fusion is the same process that occurs deep inside the sun. Under extreme pressure, atoms get pressed together so tightly that they fuse, and when this occurs, a lot of power is generated. Unlike nuclear fission (the process used in today's reactors), fusion produces no radioactive waste and is more efficient. Why aren't we using fusion today, then, if it's so much better? Well, fusion reactions are difficult to maintain and control due to the extreme pressure and temperatures required to fuse the atoms. Few materials can withstand millions of degrees. Also, an enormous amount of energy is required to generate these temperatures and pressures. Thus, man-made fusion reactions often cost more energy to create than they generate. Think of it this way. If someone offered to give you fifteen dollars in exchange for that twenty dollar bill in your wallet, it wouldn't be a very good deal, and that's fusion, at least for now. Modern fusion experiments have managed to reach the break-even point and generate as much energy as they put out, so progress is being made. The ITER reactor promises to produce more energy than it consumes and should lead to actual production fusion power plants on Earth by the late 21st century. It's this author's assumption that this progress will continue. By the mid-23rd century, fusion reactors should be small enough to fit inside a fighter plane-sized spacecraft while generating orders of magnitude more power than anything today. Propulsion: Deriving power from the fusion reactor, a set of aft rocket nozzles produce enough thrust to accelerate or decelerate a Starthroat by multiple kilometers per second within seconds. These main rockets are referred to as afterburners in the book. I did some simple math when outlining the novel and came up with something like acceleration from 0 to 1000 kps in a matter of minutes, although these are unofficial numbers that I'm pulling out of a hazy memory. One-thousand kps is the unofficial top speed of the base model Starthroats, although again, that's unofficial. For some perspective, one-thousand kps is about one-third of one-percent of the speed of light. A Starthroat also features a set of front retrorockets for slowing down. These retrorockets are smaller and don't generate as much thrust as the afterburners (if they did, they'd destroy the cockpit and fry the pilot). Therefore, the retrorockets are used to decelerate over a longer period of time. If a Starthroat needs to slow down quickly, it alters its attitude (orientation) by 180 degrees (faces the opposite direction) and fires its afterburners, an act that would violate the laws of aerodynamics in an atmosphere. Modern aircraft make use of air resistance to slow down from relatively low speeds, so they don't possess jet engines that thrust forward. In space, there's no air to slow an object, so the object needs rockets in more than just the back. Airplanes maneuver by moving flaps on wings and tail fins. Air flow hits the surfaces of the flaps at different angles, pushing the plane in various directions. But spacecraft make use of smaller rockets known as thrusters to change direction. A Starthroat has hundreds of tiny thrusters embedded all throughout its fuselage, which allows for quick changes in orientation in space. This array of thrusters is referred to as a reaction control system (RCS), which the real space shuttle and most modern spacecraft employ. Starthroats also possess backup momentum wheels and gyroscopes, which alter attitude through rotational force, although I don't go into this in the book. One thing I never did work out was the issue of particle expulsion from the rocket nozzles. "For every action, there is an equal and opposite reaction." That's Newton's third law, which allows rocket engines to function but also presents a problem. A rocket works by pushing a mass of particles out the nozzle. The force of the particles exiting pushes the rocket forward. In today's modern rockets, the solid or liquid rocket fuel provides both the power/fuel and expulsion mass. Once the fuel-mass is expelled, there's nothing left to push the rocket forward. So, even with future fusion reactors providing a lot of power, a Starthroat can only carry so much expulsion mass, and that mass will likely run out long before the power. So how does a Starthroat carry enough expulsion mass to keep going as long as it has power? This continues to elude me, and I'm open to suggestions. Gravgel: I wrote a separate blog article on gravgel, so I'll only cover the basics here. Gravity gel, or gravgel for short, is a clear, viscous substance that fills the cockpit of a Starthroat, immersing the pilot. Gravgel cushions the pilot against the force of acceleration or deceleration, allowing him or her to withstand hundreds of gees. This technology allows future pilots to take advantage of the greater thrust their future fusion engines can produce, given that the human body can only handle a handful of gees. Thanks to gravgel, Starthroats with human occupants can achieve great speed and slow down in a relatively short amount of time. Neurotronics: I plan to write a separate blog post on this topic, so I'll only cover the basics. As we know today, electronics are devices that function via electricity. Neurotronics, then, are devices that function via neural impulses from the brain. Brain wave activity travels through neural or bio circuit pathways that connect the human mind to technology. Neurotronic circuitry also forms the basis of computing (matrix) and AI technology. Brooke has neurotronic padding in her helmet. This padding transmits her thoughts to her Starthroat and support AI, granting her a level and speed of control that far surpasses working external controls. In the time it takes a modern pilot to consider grabbing a joystick to avoid incoming fire, a Starthroat pilot's mind has processed situational data, considered options presented by the support AI, and executed multiple maneuvers. In short, neurotronics allow future pilots to react to situations orders of magnitude faster than modern pilots. This is a necessity given that things move at much greater speeds in space. Weapons:A Starthroat wields two basic types of weapons: particle cannons and seekers. Think of particle cannons as mini particle accelerators. The cannons shoot clumps of particles at speeds approaching the speed of light, made possible by the power available from the fusion reactor. At such high velocity, the particles have a lot of kinetic and destructive energy (far more than a bullet fired in Earth's atmosphere or a micrometeroid in Earth orbit). These particle bursts are not your typical Hollywood bolts of colored light, although the resulting aesthetics are more or less the same. Seekers are tiny missiles with nuclear warheads not unlike today's hydrogen bombs, only much smaller. These projectiles accelerate at thousands of gees to reach their targets very quickly. The more advanced relativistic seekers, termed r-seekers for short, possess anti-matter warheads and accelerated at tens of thousands of gees. Defensive Systems:A Starthroat's flexible fuselage is constructed from a metallic and carbon-based composite that's much, much stronger than any material available today. Using the power of the fusion reactor, the craft can also generate an elliptical electromagnetic field (force field) to surround the craft. The field provides primary radiation shielding and can withstand multiple particles bursts and one or two seeker strikes before failing. Repair Systems:The malleable smart metal composite comprising a Starthroat's fuselage contains tiny nanites (microscopic robots) that start repairing damage immediately, provided the damage isn't too severe. Construction: In the twenty-third century world of BC9, space factories exist that utilize in-situ resources (materials found in space) to construct spacecraft in space. This eliminates the need to launch construction materials into orbit and thus drastically reduces building costs. Simply constructing spacecraft in space will be a huge game changer for the real space industry someday. Starthroats, spacecraft carriers, and all spacecraft are constructed in space from resources mined from asteroids. Asteroids contain more raw materials than the Earth. In the Star Trek reboot movie, the Enterprise is constructed in Iowa on Earth. However, I guarantee you that a real spacecraft of that size and shape would never be constructed on the surface of a planet with Earth's level of gravity. The Enterprise has some gravity-defying tech that makes the ship able to get off the ground more easily, but that tech isn't very realistic according to modern scientific knowledge. In conclusion, these are the kind of details that make for a well-rounded and believable story, provided the author doesn't bombard the reader with too much all at once. Perhaps most importantly, this is the kind of dreaming that lays the foundation for building the real thing someday. Here's betting you wouldn't mind owning one of your own!